Preheat oven to 350. Set a kettle of water to boil. Butter six 6-ounce custard cups and place in a baking dish or roasting pan, lined with a dish towel to anchor the ramekins. 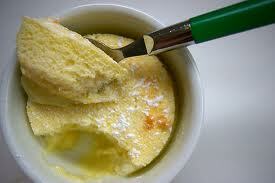 In a large bowl, whisk or beat egg yolks and sugar until light; add flour. Gradually add lemon juice, then milk and zest. Beat egg whites and salt until soft peaks form. Add to lemon batter and fold in gently with a whisk (batter will be quite liquid). Divide batter among prepared custard cups; place baking dish in oven and fill with boiling water to reach halfway up sides of cups. Bake until puffed and lightly browned (but pudding is still visible in bottom), 15 to 20 minutes. Serve slightly warm or at room temperature, dusted with confectioners’ sugar. This entry was posted in Desserts, Recipes and tagged cake, custard, dessert, lemon. Bookmark the permalink.